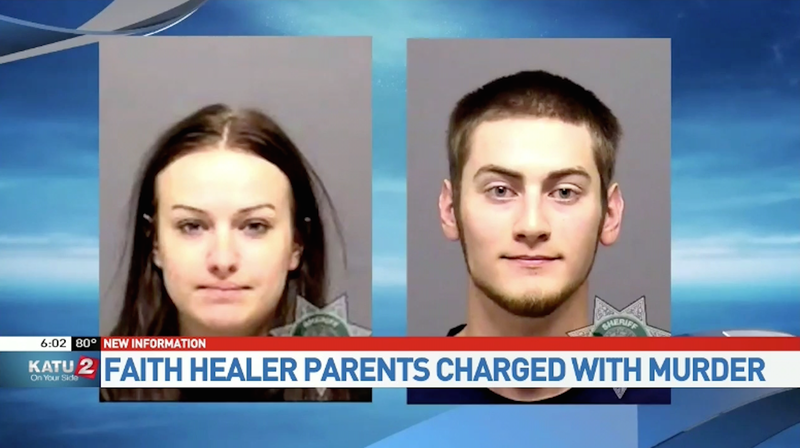 Sarah and Travis Mitchell are members of the evangelical church Followers of Christ, a faith-healing sect that’s most prominent near Oregon City, Oregon. On March 5, their daughter Ginnifer died at the couple’s home not long after she was born. Her parents are being charged with murder and criminal mistreatment. The Followers of Christ Church attracted national attention in 2011 when two members, Dale and Shannon Hickman, were convicted for manslaughter after the death of their newborn. The church does not believe in medical intervention, and treats illness with prayers and anointing oil. In the case of the Mitchells, Sarah gave birth to twins with just her family and members of the church, including three midwives, in attendance, according to KATU. A few hours later, Ginnifer showed signs that she was having difficulty breathing, then died. Evelyn appeared to be healthy and alert, but was about the same size as Ginnifer and it concerned the medical examiner, the affidavit said. Tonsfeldt said he told the girls’ parents and others at least three times that Evelyn was “at medical risk” due to her size and should go to a hospital immediately. Walter White, Sarah Mitchell’s father, replied, “Thank you for your input,” according to the affidavit. Tonsfeldt called Oregon City police after he left the home and asked for a welfare check on Evelyn to see if she was being taken to a hospital. The Followers of Christ Church, and the 2011 Hickman case in particular, caused Oregon Legislature to change the laws, banning “spiritual treatment” as a defense for homicide charges. The Mitchells are being held without bail and will make an appearance in court again on June 30.